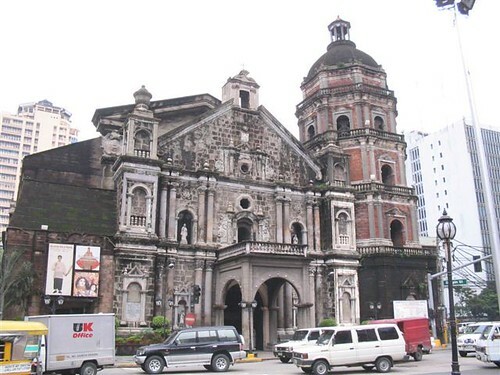 Quiapo Church, also known as the Minor Basilica of the Black Nazarene, is the site of the annual January Black Nazarene procession. One of Manila’s most famous churches, Quiapo Church gets very crowded every Friday when thousands of devotees come to light a candle in supplication to the Black Nazarene, a life-size image of Christ believed to be miraculous. Around the church is a fascinating gathering of vendors selling candles and curiosities like amulets and folk cures for obscure ailments. 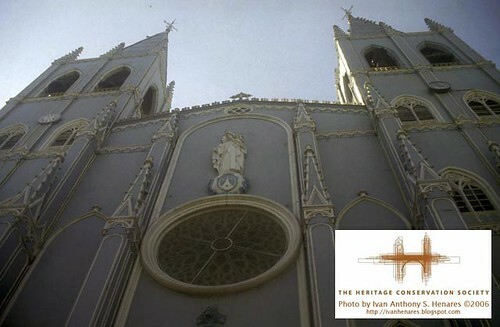 The present cream-colored edifice was built after the original Mexican Baroque structure burned to the ground in 1928. The conquering troops of Legazpi, upon landing in Cebu, in April 1565, discovered an image of the Christ Child inside a burning house. The soldier Juan Camus, a Basque, found the image still inside a wooden box. The image was clearly the Santo Niño done in the style of Flanders. The Augustinians in Legazpi’s expedition regarded the finding as an omen of good things to come. Thereupon the Augustinians established their first house. It was 28 April 1565. 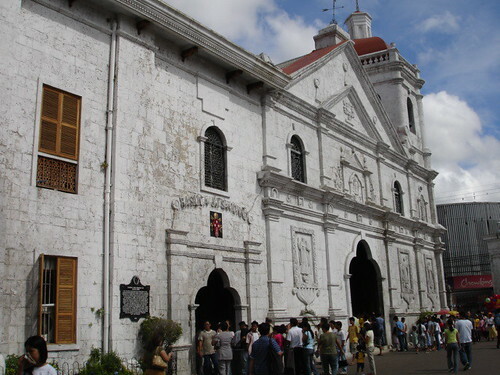 On 8 May Legazpi and his men drew up plans for the urbanization of Cebu and a site was allotted for a church and convent dedicated to Saint Augustine. A chapel of wood and nipa was hastily built and with appropriate ceremonies the image was enthroned in the chapel. On 1 June, Fr. Diego de Herrera, OSA was appointed as the first prior of the convent. In 1578, the convent was authorized to accept novices and in 1599 became a house of studies. Here Fr. Alonso de Mentrida studied and taught the Visayan language. 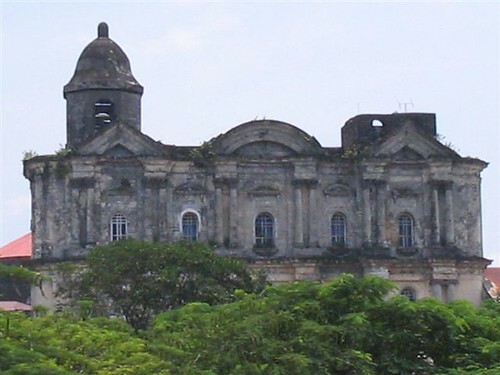 The convent also served as an infirmary and rest house for other Augustinians working in the Visayas. This makeshift chapel built in 1565 by Herrera was gutted by fire in 1566. In 1605, Fr. Pedro Torres started a church of similar material. It was finished in 1626 but burnt after two years. Fr. 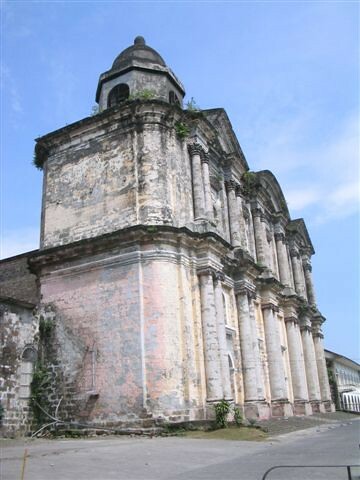 Juan Medina started a church of stone in 1628. The next report we have about the church comes in 1729, it says that the church was in danger of collapsing and hand to be replaced. Demolition of the old church began in 1731, and work on a new one of brick was undertaken. However, the following year work was stopped because of the inferior quality of the brick which deteriorated quickly. On 29 February 1735, foundations for the present church was begun. 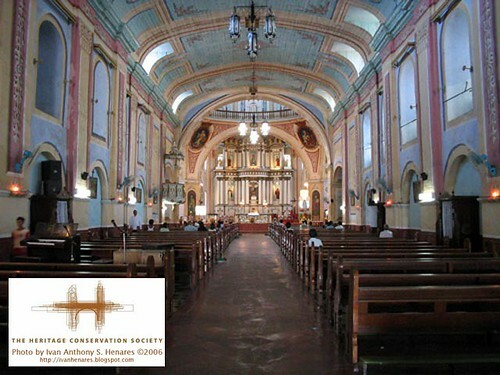 Supervised by the prior of the convent, Juan de Albarran, OSA, the new church was built of coral blocks quarried from Panay and Capiz, and molave wood from Talisay and Pitalo in Cebu. The church was completed not later than 1739. This year Fr. Albarran wrote a full report on the construction of the church, which according to some historians served as a manual of church construction for other friar builders. 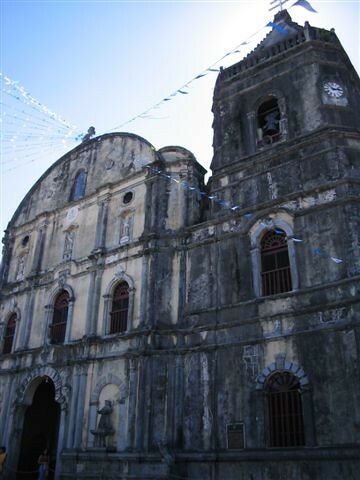 In 1740, the image of the Santo Niño was solemnly installed in the church. The church was restored in 1782 and in 1889. Fr. Mateo Diez was responsible for the work in 1889. He had the interior and the main altar repainted, installed side altars, improved the windows, and had a marble floor laid out. 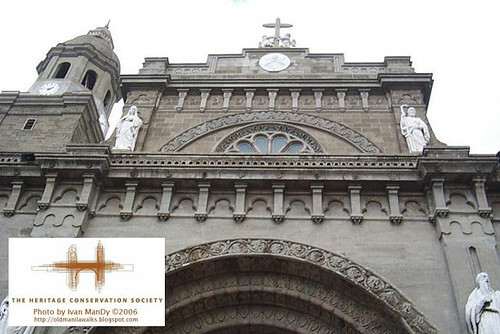 The church underwent major renovation for the quadricentennial of Christianity, celebrated in 1965. Marble was laid on the floor, stained glass windows added and the interior refurbished. The side altars, the pipe organ and parts of the convento were removed. The windows placed by Diez were replaced with stained glass depicting the history of Christianity in the Philippines. In the 1980s, the sacristy suffered an electrical fire, affecting the even the retablo, but all traces of damage have been removed. 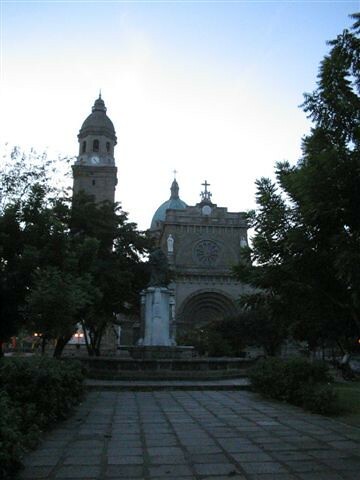 Pope Paul VI raised the church to the status of basilica minore. The papal legate, Cardinal Hildebrando Antoniutti, conferred the title on the church. Heritage Features: The church is cruciform. 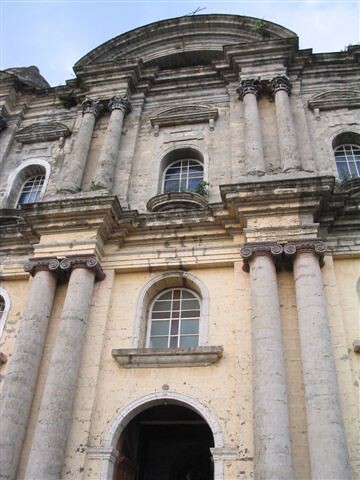 The facade, made of cut coral is decorated with niches in which images of saints are placed. The church portal shows Moorish influence in its use of the trefoil arch. Above this portal is high relief of the Santo Niño defeating the devil. To one side of the facade is a quadrilateral bell tower. The same program of decoration found in the facade–arches and saints–is repeated in the bell tower. Two stone Chinese-style lions lead to the church interior, made more spacious, during the 1965 renovations. The interior comes to a focus at the main retablo. Its design is unusual because of the many niches and saints adorning it. More than a dozen statues are found on the retablo. The whole rests on a high plinth decorated with bas relieves of griffins. Worth noting in the interior are the carved lattice screens of the choir loft, the stained glass windows and the corn motif decorating the capitals along the nave. The image of the Santo Niño is on a side altar by itself. Except during church ceremonies, when it is discouraged, long lines of pilgrims come to touch the Santo Niño’s cape. 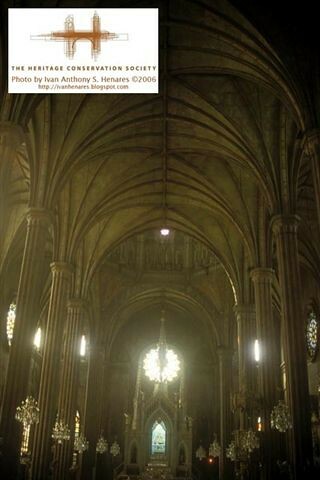 The lines form outside at the ambulatory between church and convento and winds behind the altar. 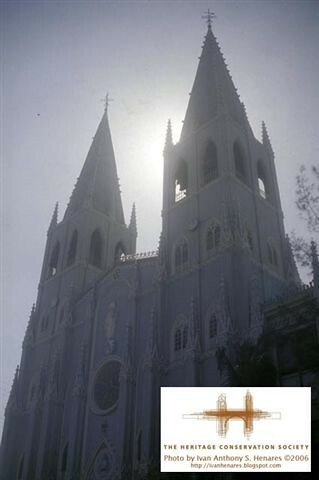 Follow the line if you want to touch this beloved icon of Cebu. 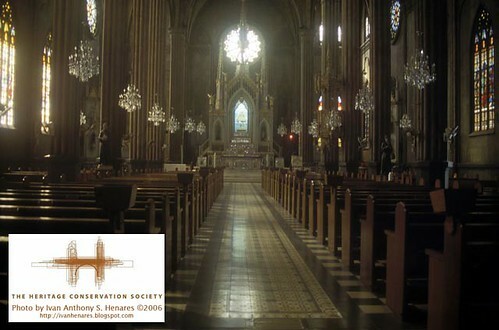 Candles are not allowed inside the church, however, devotees may light candles at designated places in the ambulatory. 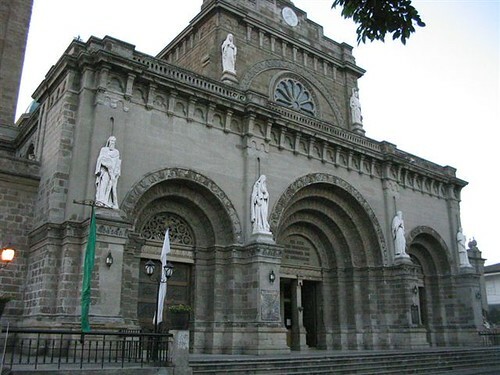 Convento del Santo Niño: Built around an atrium, the adjacent convento is still a residence for the priests. Parish offices now occupy the first story while the friars’ living quarters is on the second. An intricately carved stairway decorated by a carved newel post with Chinese-style lions leads to the spacious aula or living room, where a 19th century painting of Augustinian saints is displayed. A copy of this painting can be seen in the San Agustin Museum in Manila. Permission to enter the second story is needed. A museum to the Santo Niño of Cebu, formerly housed in one of the rooms on the first story, has been transferred to the bleachers constructed in front of the church for the Sinulog festivities and for the overflow crowd during church holydays. A footnote on Santo Niño de Cebu: The depiction of Christ the Child as king and military ruler is medieval in origin. The Santo Niño de Cebu is believed to have come from Flanders, the same image Magellan gave to Queen Juana of Cebu in 1521. The image is dressed in crimson, the color of royalty, of the Roman legion and of martyrdom. The image is crowned like a king, carries an orb and scepter or baston de mando (symbols of authority). The image wears metal boots like a soldier. The Santo Niño of Cebu is not be confused with the Infant of Praque. This Eastern European depiction of the Christ Child came later than the Santo Niño devotion. In the Praque image the Christ Child has the vesture of royalty but none of the military.